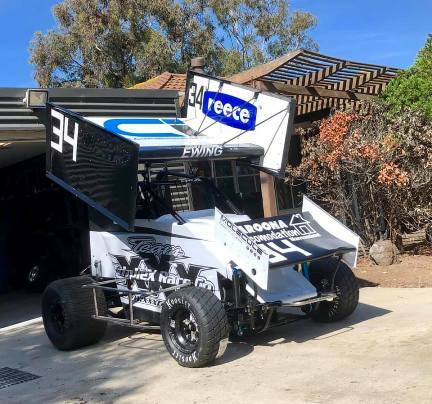 The 2018-19 season has been a memorable one for youngster Ash Ewing, who recently had the opportunity to compete in Victoria, where he experienced a competitive campaign in the Junior Formula 500s class. Based in the North Queensland regional city of Cairns, Ewing has spent the past two seasons competing locally in Junior Formula 500s, but thanks to an opportunity from Jared Desmares, this season saw him make the long trek to Victoria to support the coveted Speedweek Series for seniors aboard Desmares’s Vic # 34 Yamaha R6 powered Triple X car. With Desmares, who is originally from the Victorian regional town of Horsham, contesting the Victorian Title at Simpson Speedway, along with the second Speedweek Series round at Mount Gambier’s Borderline Speedway (SA) which didn’t feature juniors, the duo created history, being the only team to run both seniors and juniors in the same car in a single weekend. “It was really cool to be part of the Speedweek Series in Victoria as a support class,” enthused the 14-year-old racer, who required a restrictor plate to be added to the car’s engine in order to run in the junior category. “Being part of the Speedweek Series was a totally new experience to what I’m used to back home in Cairns, as the competition was tough, competing on a lot of different tracks and being surrounded by a lot of the country’s best senior drivers was an amazing opportunity. Getting his campaign in Victoria underway at Simpson Speedway, Ewing’s performance was a character building one, having started the feature race out of position five, before making his way into second and spinning out to put himself back to the rear of the field with just two laps remaining, eventually finishing back in fifth place. Things took a turn for the worst at Hamilton’s Western Speedway two nights later, with Ewing suffering engine woes; however, he thankfully experienced a change of fortune during his third outing at Darlington’s Mid-Western Speedway, coming home in an encouraging third place. Ewing was then able to build on this result in his penultimate outing at Laang Speedway, greeting the chequered flag in the runner-up spot.Unfortunately, his final outing at Portland’s Southern 500 Speedway ended much the same as his second, with Ewing’s engine blowing up on the first lap of his opening heat race while leading. Having picked up invaluable knowledge and track time throughout Victoria, Ewing looks forward to putting this knowledge into practice during 2019, with the season in Cairns getting underway in April. Ewing would like to thank his 2018-19 season sponsors: Cairns Irrigation, Reece Irrigation & Pools, Lowes Petroleum Service, Queensland Speedway Spares, and Rain Bird Australia. To find out more about Ewing and his team, LIKE them on Facebook by searching Ewing Motorsport.